The band would like to formally welcome our new Musical Director Ian Scott. Starting life as a player for Hickleton Main Miners Band he went on to become Principal Trombone for Yorkshire Main Colliery Band and Kibworth Band (playing under Stanley Boddington and George Thompson). Ian then joined the City of Coventry Band where he played Bass Trombone for fourteen years under the batons of Kenneth Dennison, Ray Farr and Major Peter Parkes. Ian then left to pursue his dream of living abroad in New Zealand. He joined New Lynn Citizens Band on Bass Trombone and went on to play for Continental Airlines Auckland Band. He then took up a Musical Director position at Television New Zealand Band leaving in 1994 to come back to the UK. Ian then joined 1st Section Kibworth Band as MD before his career took him back to Yorkshire to work in Sheffield. 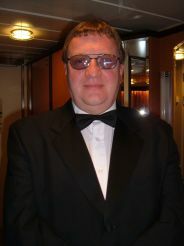 He joined Holme Silver Band as their MD before leaving in 2002 to take a break from banding. Throughout his career Ian has enjoyed lots of contesting highlights as both a Player and Musical Director including Pontins, the National Finals, Yorkshire Open, New Zealand National Finals, Holmfirth, Malton, Midlands and Milton Keynes. He then joined various bands as Musical Director including Chapeltown Silver Band, South Yorkshire Police, Tintwistle and Kibworth before moving to Filey and agreeing to join the East Riding of Yorkshire Band.